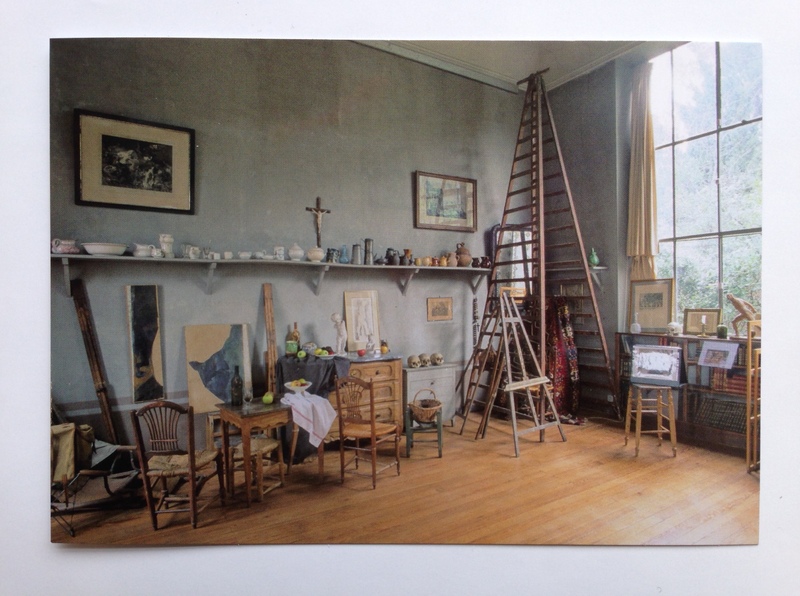 Georgie Hopton, artist, on her postcard of Cézanne’s studio in Aix en Provence. GB Tell me why you chose this. GH I’ve long been obsessed with other people’s studios. Being an artist, it doesn’t take long after leaving college that you realise the most important place in the whole wide world is your studio. So it’s natural to be interested in other people’s studios but even more natural to be deeply interested in the people you really admire and made what you believe to be the most important contribution. Cézanne is the beginning of Modern art. His position and vision are so extraordinary because there’s something about the work that seems so humble – and people who don’t know so much about art probably look at it and can’t understand how his contribution could have been so enormous. That dichotomy never ceases to amaze me, between the humble still life or landscape and the knowledge that what you’re looking at is so important, not just to Modern art, but to what you are trying to do as an artist living today. So I was really ready to visit his studio. Even though he only worked there for four years, the sensation was so powerful. It’s not that you feel the ghost of him, but it’s the resonance. And of course there are so many objects – the little ginger jar, the little green jug, the putto on a stand – I know these from his works and I feel very familiar with these things. And he believed that these objects had souls and spoke to him, like people, they demanded certain things of him. Like Morandi, he felt as though he were painting portraits of the objects when he was painting them. When I work with still life I choose an object I feel akin to, not simply in terms of its shape or form, but absolutely because it has a personality. So the fact that you can walk into Cézanne’s studio is like a small miracle for me. He had that studio built and argued heavily with the architect because he wanted a simple utilitarian space. There’s a huge north-facing window and to the right hand side of it there’s a skinny door that goes from floor to ceiling to give access to large paintings. It looks so modern. The walls are this very matt blue-grey that feels as though it has layers like a painting. Lower down the wall is a soft wine colour that gives the effect of a dado rail. That touch brings this lovely little moment of interior design into a purpose built studio. They’re nothing like the colours in his paintings but the objects come to life in there. GB Which is how he used colour in his paintings, to change the way we see the geometry of things. GH I feel as though he was describing the interior geometry of things. That way of inside and out both existing at once was utterly ground breaking in painting. GB Do you think he was concerned with beauty? GH I think he definitely thought about it, but I don’t think for a minute he aimed for beauty from the start. He wanted people to question what they were seeing. And a lot of people thought that it was nonsense. Each tiny brush stroke that describes that internal architecture was such a phenomenally different way of working. GB Do you think he was self-consciously trying to change the world? There’s something so sincere about his paintings, I find it hard to believe that it was calculated in some way. GH You couldn’t make paintings like that at that time without wanting to do something historically important. They wouldn’t have been so shocking. They wouldn’t feel so alive, so crucial to us now, if he hadn’t wanted to change the world. GB And yet he didn’t want his paintings to clash with what he called ‘God-made objects’ like trees and flowers. Perhaps that’s where the beauty comes from. GH Yes, I agree. It’s a very gentle anarchy. People had never seen anything like this before but there’s no violence to it. There’s just an absolutely penetrating search. GB He died just a few years before all the angry artist manifestos were written, before the Futurists proclaimed that “the only beauty now is the struggle.” What do you think he would have made of all that? GH I think he would have really liked that they were searching for something else but I can’t imagine he would have liked the aggression. He was in this lovely studio, surrounded by nature, walking in the mountains and barely seeing anybody. I can’t imagine that way of wanting to collectively shout would have appealed to him. But I also can’t imagine him not relishing that it was happening. GB Do you think he saw art as something that brought him closer to God? GH Yes and being someone who isn’t religious and makes works I feel it does exactly that – but I don’t call it God, rather a spiritual world, which for me is art and a place where magic happens – things that you can’t explain or even discuss. I think beauty is part of that but not necessarily a conventional notion of beauty. A lot of Van Gogh paintings are very garish, but they are deeply beautiful. Maybe more so because we know his story and how tragic it was, how he lived to work and believed he’d never succeeded in making a good painting. GB You seem to look for visual rather than conceptual appeal in art – your own and others. GH For me, it’s wanting to make people feel what I’ve felt in front of art which seems to be such a necessary feeling to have in life. GB So what do you think of people like Duchamp? GH I think it’s really important to smash your idols. I love iconoclasts. I’m just not one of them. Although in the context of contemporary art it’s now iconoclastic to make beautiful things. I think there’s room for everything. Life and art are a series of reactions – which are clearly illuminated in fashion. Some years ago I decided to make still life my subject and I took great pleasure in recognising that that was quite a radical decision. To a lot of people, Manet’s last paintings of flowers that he did when he was bed-ridden are utterly radical. That’s what I’m interested in. GB So is seeing a Cézanne painting a complicated aesthetic experience for you? GH It’s a poignant combination of gratitude, because I know what he did vindicates what I believe art can do, and also sadness because I’m so unable to do something as great as that. GH It’s something that gives me the sensation that I’m alive.